SICAS Account allows international applicants to DIRECTLY apply to China’s universities for their favorite courses. In order to help you complete the SICAS on-line application, SICAS makes the following simple instructions which we strongly advise you to follow. The university requires you to complete the above first three sections listed first in order to examine your overall candidature and make a decision about your application. Once you have finished all the blank sections and submitted your application, you can click the button “Track Admission Status” to know how the university access your application. How to go to Track Admission Status? The following are the full explanations for each section. A. Personal Details Please ensure the personal information you fill in is true and correct. Whenever required to fill in your email, please be sure you offer the current and effective one for the universities will email the scanned copy of your acceptance letter and JW202 forms to the address that you filled. B. Education You are required to provide the information for all completed and incomplete secondary, vocational, technical, undergraduate or postgraduate training and qualifications. Please click “add new school “to complete it. E. Proposed Study in China Not all the programs require you to fill in this item. If required, you should clarify your proposed duration of specialized study in China and also state whether you need a pre-degree course to learn Chinese if your future course is taught in Chinese, and then fill in other information according to the guidelines. F. Financial Guarantee Please state the source of financial support for your study in China. G. Family Members' Information You will be asked to provide general information about your family members. Please note the required information will only be used by your future university for your application. H. The Emergency Guarantor The emergency guarantor will be in charge of your case in China if the university or other institution can not contact with you in some very urgent situations. If the university does not mark this item as required, you can leave it blank. If the university you are applying requires an emergency guarantor. You may list your parent or relatives or even SICAS as your guarantor. I. Declaration Make sure to fill the exact posting information here.Your original admission letter and JW202 will be posted to the address here. Both of the two documents are pre-requisite for applying a student’s visa to study in China. The instructions listed below the blank and behind the blank noticed with is the further direction to help you fill each item correctly. Each university, and even different program offered at the same university, has a different application form. Compulsory fields are marked with an asterisk (*). Before leaving this section please click 'save' to avoid losing any information. When you have finished all the entries please click on 'section completed' and 'save'. The application process on SICAS is entirely online. Students don't need to download any application forms. Once you click the 'Apply now' button, the SICAS system will automatically guide students to fill out the correct application form. Once you fill out the application form for one university, the SICAS system will record the information you fill in. If you apply for another program, the information you filled out from before will be automatically transferred to the new application form. According to the university’s admission criteria, you are required to upload photocopies of required application documents. C. Each file exceeding 8 MB (megabytes) can not be uploaded and all the materials should be image files (.gif, .jpg), Adobe PDF, (.pdf) documents, MS-Word (.doc), or compression files (.rar, .zip). A. Click ‘SELECT FILES’ in the column of 'File Uploads'. B. Choose the required documents from your computer. C. Click OK to upload. The uploading time may vary from several seconds to one minute according to your local connection speed. When your documents are uploading, please DO NOT leave the current section or make any changes. What photocopies of the documents to upload? You may be asked to upload more documents depending on each university’s detailed requirements. This section allows you to make payment and submit your application to the university. Please pay the application fee and SICAS processing fee in order to submit your application. An application fee is charged by the individual university or universities that you apply to. The application fee of a Chinese university is usually between 60-120 USD depending on schools and types of courses.Based on the agreements between SICAS & China’s universities; SICAS does the collection of application fees for universities. Six types of payment methods are offered by SICAS for you. An online invoice from SICAS help you to make an offline payment more conveniently. Click on ‘Browse Invoice’ to see your SICAS invoice. Please take the invoice with you when you wire the money. If you select Western Union or Bank transfer as the payment method, you need to upload the payment receipt after wiring the money at the post office or bank. To submit your application, please access My SICAS-> My Applications by logging in SICAS, click 'Not Yet' in the column of 'Send to Uni. or Not'. You will see a big 'Send to University”. Click the button and your application will be sent directly to the university. Once you’ve sent your application, please wait 1-3 weeks for the admission office of the university to check the application materials and process your application. Once the admission office of the university has made any the updating of your admission status, SICAS will notify you to” Track Admission Status” in your “MY SICAS Account”. And also through a confirmation email to your registered email address. The confirmation email will lead you to” Track Admission Status” in your “MY SICAS Account” for details. Please make sure to fill your valid email when registering and please also verify it when you login to “MY SICAS Account”. Once you are accepted by the university, the admission office will post your original admission letter and JW202 form. It takes 5-16working days to reach you. Both of the two documents are pre-requisite for applying a student’s visa to study in China. How to go to “Track Admission Status”? The part of Track Admission Status can only be available for you when you have completed the first three steps. 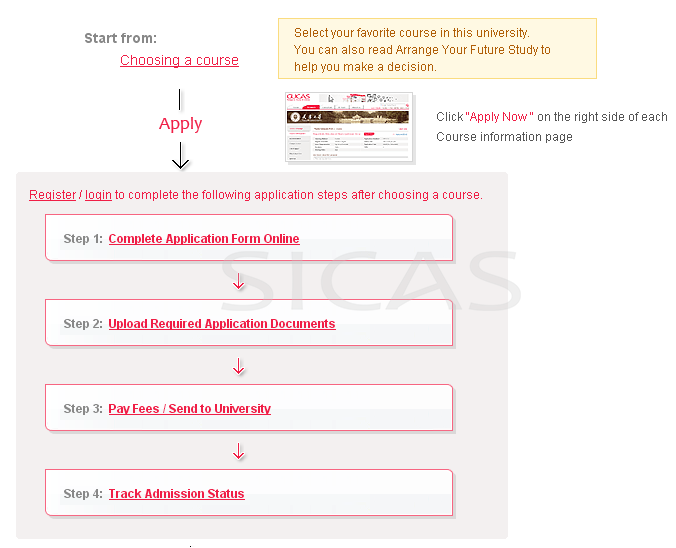 As the following picture shows, once you have finished all the black sections, you can click the button “Track Admission Status”in”My SICAS Account”or”Track Progress”on the home page of SICAS to track your application status every time. What does my admission status mean? The university is processing your application and will notify you in no time. The university has accepted you and will upload your Admission letter once it is ready, please check in due time and reply to the university if you accept it, then the university will upload your JW 202 form, vice versa. The university have checked your application documents, but they need to be revised according to the university’s request. Sorry, the university can't accept your application. The university has posted your original Admission Letter and JW202 by courier to you. After you complete your application form, upload all the required application materials and make payment as well, the 'Track Admission Status' can be open for you. You can log in your SICAS account and click 'Track Admission Status' to check your admission status.